This ad raises a number of interesting questions, no? Are the "writers" at Cadillac pulling a Kenneth Goldsmith who, in his book Uncreative Writing: Managing Language in the Digital Age, argues that contemporary writers "confronted with an unprecedented amount of texts and language" in databases and other electronic and digital forms now "have the opportunity to move beyond the creation of new texts and manage, parse, appropriate, and reconstruct those that already exist"? 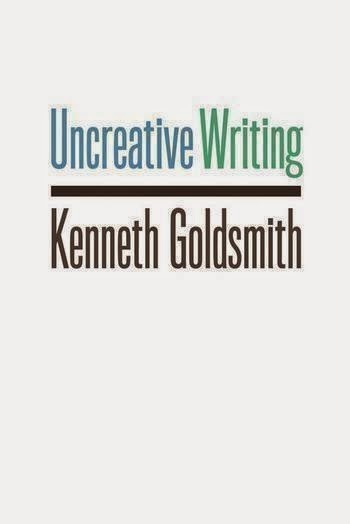 Perhaps someone (or a team of someones) from Goldsmith's famous class on the topic of uncreative writing at the University of Pennsylvania has found gainful employment at the advertising agency working for Cadillac and is trying to "reconceive creativity, authorship, and their relationship to language" via General Motors and not from the innovative artistic fringe? 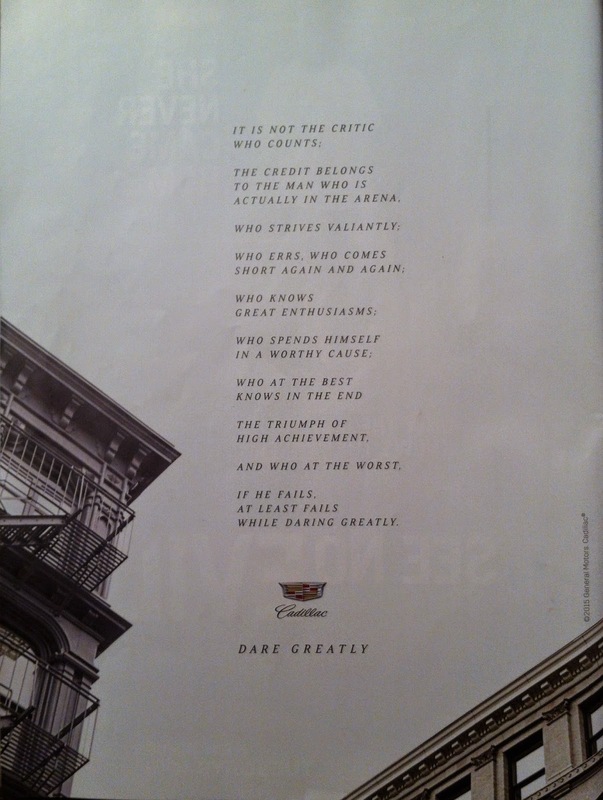 Are these writers daring greatly? And how, exactly, are they managing, parsing, appropriating, and reconstructing previously existing texts for the commercial marketplace? There is another sky, Ever serene and fair, and there is another sun-shine, tho it be darkness there—Never mind faded forests, Austin, never mind silent fields—Here is a little forest, whose leaf is ever green; here is a brighter garden, where not a frost has been; in its unfading flowers I hear the bright bee hum; prithee, my brother, into my garden come! The history of "There is another sky" prompts a number of questions from Jackson about when the poem in fact became a poem. "Was it never ... a poem," she wonders at one point, "since it was never written as verse? 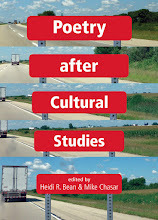 Was it always ... a poem, because it could always have been read as verse? Or was it only ... a poem after it was printed as verse?" 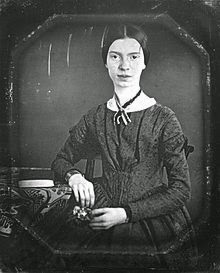 Later on, she continues with related questions: "In view of what definition of poetry would Dickinson's brother have understood the end of his sister's letter to him as a poem? Did it only become a poem once it left his hands as a letter? According to what definition of lyric poetry did Dickinson's editor ... understand a lyric poem to be if it was not the passage at the end of the 1851 letter? Can a text not intended as a lyric become one? Can a text once read as a lyric be unread? If so, then what is—or what was—a lyric?" So, let's go ahead and rephrase Jackson's set of questions with the Cadillac ad and Teddy Roosevelt's words in mind. Was the Rough Rider's speech never a poem since it was never written as verse? Was it always a poem, because it could always have been read as verse? Or was it only a poem after it was printed as verse on the back of Entertainment Weekly in 2015? 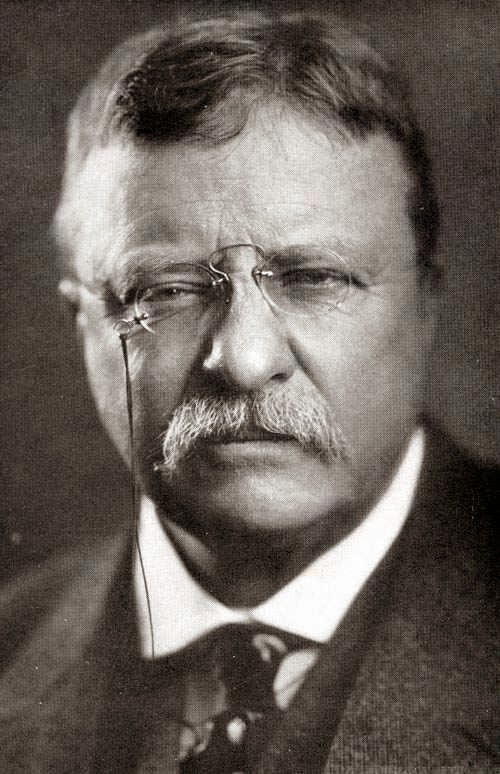 In view of what definition of poetry would Roosevelt's listeners have understood his speech at the Sorbonne as a poem? Did it only become a poem once it was delivered? According to what definition of poetry did Roosevelt's editor (here Cadillac) understand a lyric poem to be if it was not the passage in Roosevelt's Sorbonne speech? Can a text not intended as a lyric become one? Can a text once read as a lyric be unread? If so, then what is—or what was—a lyric? Your five page paper on how to best read Cadillac's poem (or is it Roosevelt's poem?) "It Is Not the Critic" is due on Monday. Dare greatly—and make your criticism count!